Aretha Franklin, revered for decades by adoring fans and fellow artists, died Thursday at the age of 76. As the news spread, other musicians, celebrities and leaders in politics and business took time to honor the legend who inspired so many with her powerhouse voice and renowned songs. 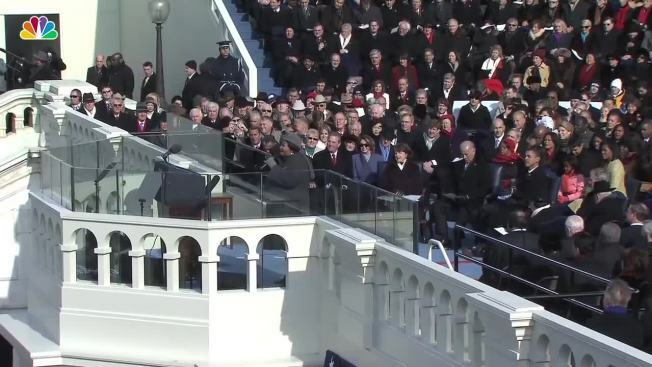 Former President Barack Obama, who watched Franklin perform a soulful rendition of "My Country ’Tis of Thee” at his first inauguration, said in a statement with wife Michelle Obama that the singer "helped define the American experience." The pair wrote: "America has no royalty. But we do have a chance to earn something more enduring. ... For more than six decades since, every time she sang, we were all graced with a glimpse of the divine. ... In her voice, we could feel our history, all of it and in every shade—our power and our pain, our darkness and our light, our quest for redemption and our hard-won respect. She helped us feel more connected to each other, more hopeful, more human. And sometimes she helped us just forget about everything else and dance." Michelle Obama added on her Twitter page that Franklin's many performances "made time stand still." "I’m sitting in prayer for the wonderful golden spirit Aretha Franklin," wrote Diana Ross, Motown icon and former The Supremes lead singer. Bernice King, daughter of the late Dr. Martin Luther King Jr., also recognized Franklin, whose 1967 hit "Respect" became an anthem in the civil rights movement and other campaigns of the time. Franklin was a longtime friend of King Jr. and sang at his funeral in 1968, as well as his memorial dedication ceremony in 2011. "We were blessed to live in a world with #ArethaFranklin. Beyond her tremendous singing voice, she was a voice in the Civil Rights Movement. An instrument..." Bernice King tweeted. Rep. John Lewis, another prominent activist of the civil rights era who helped organize the 1963 March on Washington, honored Franklin's "unwavering commitment to civil rights." He called her "our sister and our friend" who "embodied what we were fighting for" when she sang. "Her music strengthened us. It revived us," Lewis wrote in a statement. He added: "When we would be released from jail after a non-violent protest, we might go to a late night club and let the music of Aretha Franklin fill our hearts. She was like a muse whose songs whispered the strength to continue on. Her music gave us a greater sense of determination to never give up or give in, and to keep the faith." Rev. Jesse Jackson echoed her advocacy for "civil rights, justice and R-E-S-P-E-C-T," adding that "she was a world transformer." "We shall never, ever forget her crowning glory," Jackson said in a statement. "What a life. What a legacy!" tweeted musician Carol King. "So much love, respect and gratitude." 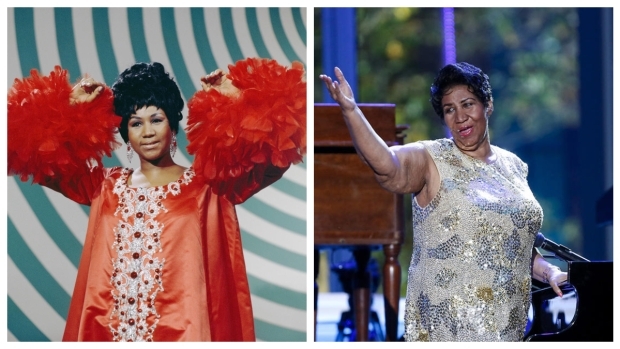 When King was recognized at the 2015 Kennedy Center Honors, Franklin surprised her with a musical tribute. Performing in front of King, the Obamas and a packed audience, Franklin brought down the house with "(You Make Me Feel Like a) Natural Woman," a song written by King and driven to the top of the charts by Franklin. President Donald Trump tweeted that Franklin was "a great woman, with a wonderful gift from God, her voice. She will be missed!" "Her voice; her presence; her style No one did it better Truly the Queen of Soul I will miss you!" singer Lionel Richie said in a statement. Barbra Streisand, a musical legend herself, shared a 2012 photo with Franklin when the two performed at a celebration for friend and composer Marvin Hamlisch. "It’s difficult to conceive of a world without her," wrote Streisand. "Not only was she a uniquely brilliant singer,but her commitment to civil rights made an indelible impact on the world." Elton John said Franklin was "one of my favourite pianists" and remembered the last performance he saw of hers, during a benefit concert for his AIDS Foundation. "She sang and played magnificently, and we all wept. We were witnessing the greatest soul artist of all time. I adored her and worshipped her talent. God bless her," he wrote on Twitter. Record producer Clive Davis said in a statement that he was "absolutely devastated by Aretha's passing." "She was truly one of a kind," he added. "She was more than the Queen of Soul. She was a national treasure to be cherished by every generation throughout the world. Apart from our long professional relationship, Aretha was my friend. Her loss is deeply profound and my heart is full of sadness. Read more tributes and testimonies below. Aretha was Detroit’s sister, auntie, momma, Queen and homegirl — all in one career. There are few people that defend, honor and protect someone the way we did Aretha. You can talk about our economy, and our crime, but say something about Re-Re, and you’ll get dealt with. Quick. RIP Aretha Franklin. I will always know and be in awe of the power and beauty of your voice. So sorry to hear about the death of Aretha Franklin at the age of 76.I’ve been playing her records since the 60’s and thought her music was wonderful. R.I.P. RIP to Aretha Franklin, the Queen of Soul, whose R-E-S-P-E-C-T became an anthem of the civil rights era. Sad news today. Her music will live on. Thank you for everything you gave us, #ArethaFranklin. May the 'Queen of Soul' Rest in Peace.